Brazil – Not yet ‘happening’ in India! In a country where precious time is spent outside the American, British, Canadian and Australian embassies, and migration is the ultimate climax, the average Indian is always nose-diving into the Lonely Planet for those ‘ten day trips’. So Turkey, Istanbul, Egypt, Switzerland, Venice, Rome, Berlin and now even Cuba have become signifiers of ‘awesome’ summers and the new Singapores and Dubais. Talk of inflation and rising airfares anyone? Tourist operators are raking in the moolah like never before and package tours that literally ‘pack’ civilizations and cultures in ten days are mushrooming in every corner of Indian cities. Indians want to be in the ‘happening’ corners of the world. Happening is part of the Indian ‘oral tradition’. It works like the old English rhyme where everyone goes in a ‘pack’. One set of Gujarati’s tells another, and another tells a set of Punjabi’s, and these then tell another set of Bengali’s and so travels the lore. Happening is a place that does not oppose one’s essential indianness, where you can stand in the street in attires that match your own, and say cheese with a pride in having been there. Happening is a place from where you can ‘report’ about history, civilizations, new worlds, new fashions, and a sense of future, again, that ‘I’ve been there’ assertion. Man, Switzerland is ‘happening’! So, going to ibiza? Despite my own personal angst about not getting to Brazil, I think it is not yet on the ‘twin radar’ of the migratory pattern of the Indians, or on the touristic map. Neither is it remote. Most Indians dance to Vengaboys and the famous ‘Braziiiiiiil’ or ‘ibiza’ at every party, and every football crazy Indian knows the numbers on Kaka, Pele and Ronaldinho’s shirts or the latter’s new hairstyle (see the picture above of Brazil fans in Kerala, South India, during last summer's football World Cup). But Brazil, is just not ‘historical enough’, nor is it the ‘new world’ like Dubai, nor is it ‘chic’ enough for the average Indian to aspire to be seen there. So it is not ‘happening enough’. The image that is conjured about Brazil is ‘that place with those lovely beaches, and er..those well endowed men and women’.’ Goa comes closest to the idea of a seaside culture for Indians. India is capable even of being ironic bout it's own lack of true connection with an authentic Brazilianness. The picture below is from an iDiva website feature where singer Manasi Scott is shown trying to bring the Rio Carnival to Lakme Fashion Week only to evoke he response that "she looks more like a drag queen". Brazil is an image of freedom without those monumental structures that an average Indian can hide behind and watch. Unlike an Egypt or a Rome, or Venice, where you can feel the romance, but you can still put up that staid, cheesy smile with a monument in the backdrop, in Brazil you just have to stand in front of the beaches or the rainforests and of course, the chances of the mermaids and those semi-clad Tarzans appearing from nowhere is very high! Finally, the last semiotic import – when you say I went to ‘Venice’, ‘Rome’, Paris’ it is distinctly different from, ‘I went to Brazil’. From the ooooh’s and aaaaah’s, the graph dips to ‘oh’. And then a naughty grin, that says, ‘why’? Why would anyone want to brave the leeches and the thick dense rainforests or the blazing sun of the Brazilian beaches? Now, don’t look away, Brazil offers great economic opportunities, investment futures, blah blah blah………anyone listening? 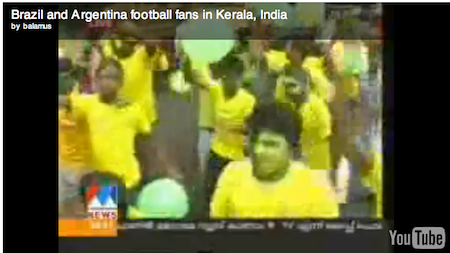 For some more examples of emerging Indian football fandom see http://wn.com/Brazil_and_Argentina_football_fans_in_Kerala,_India. Thanks for the site and the piece, Seema! Its a true treasure-trove. Been meaning to visit for the longest and I’ve finally landed! To a Western observer, especially male, visiting India one of the things that can creep up on you is the scarcity or even absence, compared with virtually anywhere else in the world, of football (either local or from other countries) on TV or in the press. In terms of team sport India is resoundingly a cricket country with hockey somewhere in there too in a supporting role. So it could be that a not ‘happening’ Brazil may have something to do with an Indian cultural hiatus, at least until very recently, in relation to football – ‘the beautiful game’ which future historians and anthropologists no doubt will look back on as one of the most central, fluid and creative global expressions of our time, with Brazil since the 1958 World Cup win in Sweden as the default top-of-mind nation in this context. (I throw that one in for discussion – please think of it as an inviting challenge not a provocation!) Another point worth making is that the culture which produced Bollywood is not necessarily going to get as worked up about the Rio Carnival’s renown for the exotic and spectacular as people elsewhere, particularly in our more repressed Anglo-Saxon cultures. It was not so long ago that for an average Indian like me the word itself signaled something bad unless you were employed by one. Words with negative associations and MNCs belonged right there..Forgive me then if my first reaction on seeing a letter in my in-tray inviting me to speak at a conference on The changing nature of MNCs was that of befuddlement with mild alarm.